Chicken Satay in its spicy peanut butter based sauce is a definite winner in our house and makes a great topping for a pizza. The original recipe used cooked chicken but you could cook an 8oz chicken breast under the grill or in the microwave, cool and then add to the marinade if you don’t have chicken leftovers. You can vary the amount of chilli used as well to suit the level of heat you like and even substitute chilli powder or flakes for a fresh chilli. I keep fresh chillis (red & green) in the freezer. You need to split them with a knife and scrape out the white seeds before chopping finely ready for use. Be careful not to touch your eyes and to wash your hands carefully after handling! This recipe comes from Step-by-Step Pizzas by Wendy Lee, a great book with everything you need to know including making basic pizza bases and preparing the Tomato Sauce topping plus a large number of different pizza recipes. 1. Mix together the peanut butter, lime juice, soy sauce, milk, chilli and garlic in a bowl. Add the chicken pieces, stir until well covered and leave to marinade in a cool place for at least 20 minutes – longer if you can to allow the flavours to develop. 2. Roll out the dough making a 25cm/10inch circle on a lightly floured surface. Place on a greased baking tin or pizza pan. Push up the edge a little with your fingers to make a rim. 4. Spread the tomato sauce evenly over going almost to the edge but keeping within the rim you have made. 5. Arrange the chopped spring onion, then the chicken pieces and the peanut sauce evenly over the tomato sauce. 6. Sprinkle on the cheese. Drizzle with a little olive oil and season. 7. Transfer to a warmed serving plate. Serve immediately with salad or, as the original recipe suggests, a simple vegetable stir fry which can be quickly cooked while the pizza is in the oven. The term ‘Marinara’ as a pasta sauce does not usually refer to the use of fish or other seafood, I know, but rather that it was served to mariners (fishermen). I probably ought to change my title to reflect this mistake, but this was the name given in the original recipe so I have continued to use it. This is unashamedly a seafood pizza and any mixture of fish can be used as a topping. Bags of mixed frozen seafood are available from the supermarket – usually a mixture of small prawns, calamari/squid and mussels. You can substitute or augment as you wish, though I am not sure I would use white, smoked or very oily fish, though pilchards might be good. You could also make this with just one variety of fish, for example prawns or salmon. This time I used half a tin of tuna, a small piece of salmon, about six crab sticks and a dozen medium sized prawns. I also used finely chopped gherkin for a similar mild pickled flavour as I had no capers and would do this again. As for the olives, I always put them on as I love them as they make a dish look attractive but they all end up on my plate as nobody else in our house likes them! 1. Roll out the dough making a 25cm/10inch circle on a lightly floured surface. Place on a greased baking tin or pizza pan. Push up the edge a little with your fingers to make a rim. 3. Spread the tomato sauce evenly over going almost to the edge but keeping within the rim you have made. 4. Arrange the fish, capers and yellow pepper evenly on top of the sauce. 5. Sprinkle over the herbs and cheeses. Arrange the olives on top. Drizzle with a little olive oil and season. 7. Transfer to a warmed serving plate and garnish with a sprig of fresh marjoram if available. Serve immediately with salad. There are several ways of making Pizza base. The traditional base is a bread dough made with yeast but there are alternatives which can come in very useful when time is short. In all cases the quantities given are for a base of about 25cm/10inches which feeds 2-4 people. 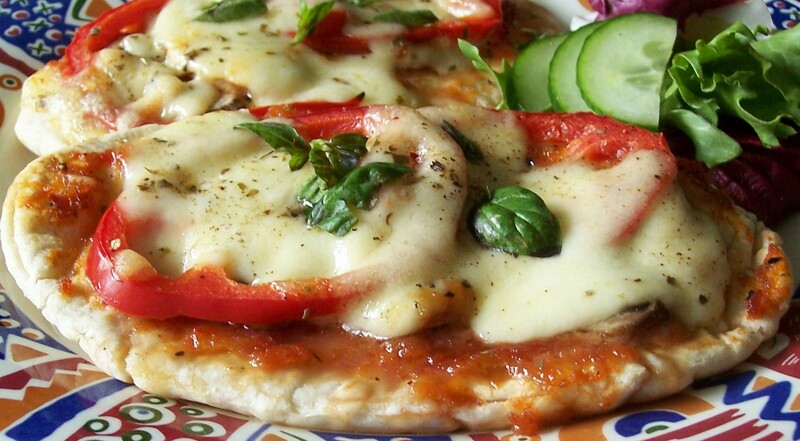 These recipes have come from my favourite pizza book Step-by-step Pizzas by Wendy Lee. 1a. Fresh yeast: combine the with the water and sugar in a bowl and leave mix to rest in a warm place for 10-15 mins until frothy on surface. Stir in oil. Sift flour and salt into a large bowl. Make a well in the centre and pour in yeast liquid. leave mix to rest in a warm place for 10-15 mins until frothy on surface. Stir in oil. Sift flour and salt into a large bowl. Make a well in the centre and pour in yeast liquid. 1c. Easy blend yeast: Sift flour and salt into a large bowl. Stir in easy blend yeast. Add water but no sugar and oil. 4. Turn out onto a lightly floured surface and knead lightly (knock back) and then knead as previously 4 or 5 times more. 5. Roll out or press into a 25cm/10inch circle on a lightly greased baking sheet or pizza pan. Push up the edge a little to form a ridge to retain the filling. 2. Rub in the butter with your fingertips until it resembles fine breadcrumbs. Keeping the mixture as cold as possible with minimal handling gives a better result. Extra flavourings such as grated cheese or herbs (oregano is good) could be added at this point. 3. Make a well in the centre of the flour mixture and pour in nearly all the milk. Draw together quickly with a knife until you have a soft dough. Add the rest of the milk only if necessary. 4. Turn the dough onto a floured surface and knead gently – turn and press with the heel of your hand 3 or 4 times only. 1. If the potatoes are hot, mash, stir in butter until melted, followed by the oil, until evenly distributed throughout and leave to cool. Sift flour and salt together and stir into mashed potato to form a soft dough. 3. Either roll out or press the dough into a 25cm/10inch circle on a lightly greased baking sheet or pizza pan. Push up the edge a little to form a ridge to retain the filling. This base is difficult to lift when rolled out so is better shaped, rolled out or flattened by hand directly on the sheet/pan on which it will be cooked. 4. If not required immediately then cover with cling film and chill for up to 2hrs. 5. Variations: Adding herbs, a small amount of chopped onion or spring onion, grated cheese or grated carrot to this base will add extra flavour. *Substitute instant dried mashed potato when leftover potato is unavailable, or for speed, but keep the consistency fairly dry. Pitta breads, either left whole or split to form very thin bases. This version topped with Tomato Relish, Red Pepper, Mozzarella Cheese & fresh Basil. ‘Pizzettes’ – individual pizzas using a 3inch/7.5cm cutter. (Idea from Cooking with Salmon by Jane Bamforth.